Uncategories The BC election begins today! The 41st general election for British Columbia is starting today, Tuesday April 11th 2017 (note: I'm a phony, I actually wrote this the 10th!). It'll last until May 9th. The BC Liberals of Christy Clark will try to be re-elected (that would be a first for Christy Clark since she became Premier but that would be the 5th consecutive mandate for this party that has literally been in power since the new century). The BC NDP of John Horgan will try to break this streak (and forget the bitter disappointment of 2013 where the polls were indicating a BC NDP victory). The Green party of Andrew Weaver can't realistically expect to win but they could force a minority government if they can win at least 5 seats. Finally, the BC Conservative party is a wild card: no leader, barely any candidate but polling high in some polls. You can of course count on me to cover this election and provide regular updates on this site (I live in Vancouver after all!). With that said, please keep in mind that BC elections do not get remotely close to the number of polls a federal election does, therefore expect updates to be less frequent or substantial. You should bookmark the BC Election 2017 page where you can always find the latest projections, poll numbers, etc. As the election begins, we mostly have two polls. The first one was published last week from Mainstreet Research, the other one was published yesterday by Insight West. They have similar yet different results. First of all, Mainstreet has the BC Conservatives at 11% while Insight West has them at only 3%. I asked their CEOs and it seems that they aren't doing anything visibly different (for instance no firm is specifically adjusting the numbers for this party based on the number of candidates). Mainstreet polls using IVR (automated phone calls) while Insight West uses an online panel. We know the method can often influence the numbers but it's hard to explain why this would be the case here. Remember that the BC Conservatives is not a party that really exists. They don't have a leader and only have 7 candidates nominated (and 3 confirmed by Election BC as of today). The 11% from Mainstreet is absolutely unlikely to happen. But for now, I can't do much but to include this number in my average. 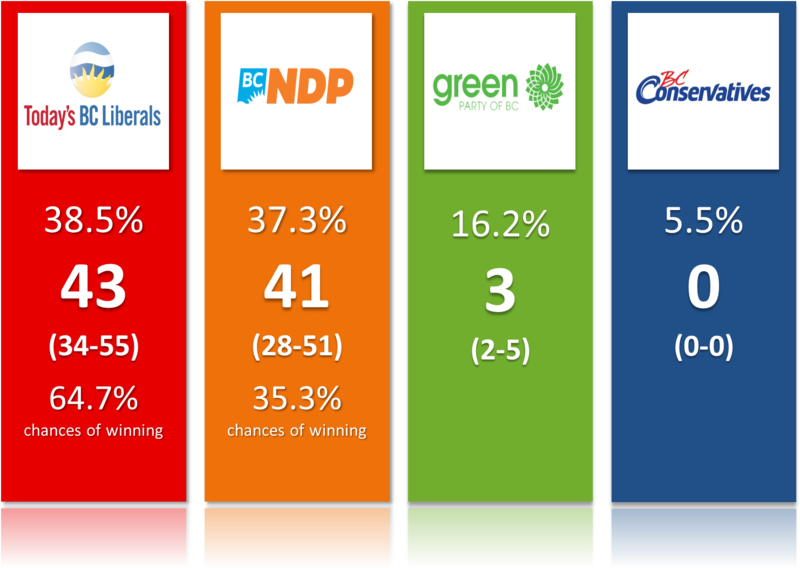 As for the other parties, both firms have a close race between the NDP and Liberals with the Green in 3rd (around 18%). With that said, the regional breakdown of each firm is quite different, especially on the Island (but remember the tiny sample sizes and therefore large margins of error). 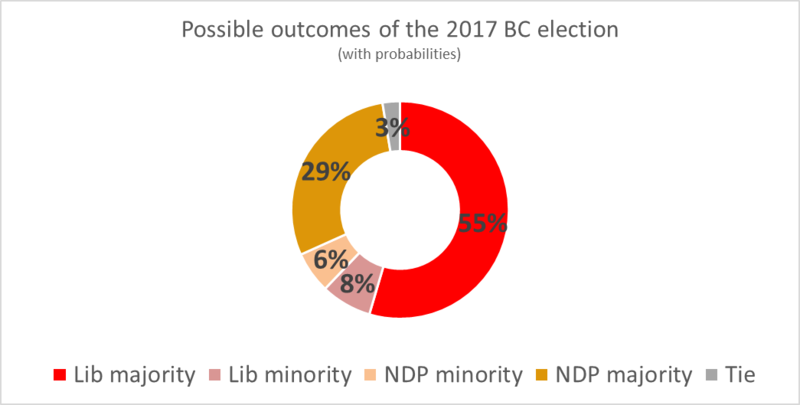 Speaking of average, regular readers of this blog will have noticed that I now have the BC Liberals slightly ahead while I had the BC NDP leading until now. This isn't a mistake. Until now, I was using the numbers as directly provided by the pollsters. But they tend to allocate undecided proportionally. I prefer a non-proportional method where the small parties (any party except the Liberals, NDP and Green in BC) do not get any. Also, I give slightly more undecided to the incumbent because polls have systematically underestimated the incumbent party. If you think those assumptions are wrong or idiotic, just use the simulator with your own numbers. There are currently a lot of undecided (more than 20%), my adjustments therefore switch the race from a NDP lead to a Liberals one. As we get closer to the election, the undecided will decrease and my average will be closer to the pure poll average. I'd like to mention that these adjustments have proven to work well in many elections in this country, including in the federal election of 2015 where I actually had the Conservatives closer than most (it didn't help much there since the Liberals beat their poll numbers by even more! But the point remains). Look, I get it, what I'm doing here will upset some of you. I even expect some of you to call me a "Liberal shill" or something like that. I have done non-proportional redistribution of the undecided since the 2014 Quebec election (successfully). I did it during the Alberta election (again with great success) and I did it in 2015 for the federal election (it worked for the CPC but the Liberals also got more undecided, mostly taking them away from the NDP). In the case of the BC election, if I see the NDP becoming the clear choice from the "let's get rid of the BC Liberals crowd", I'll change my allocation (most likely giving the undecided mostly to the Liberals and NDP and none to the Green). But the Greens currently have the momentum, so it wouldn't make sense for me to make this assumption. Also, let's be clear, with a proportional allocation, the NDP would get around 40% of the undecided. With my method, this party gets 35%! Yes it's different but it's also not that big. Finally, let me be very clear, if I were to simply take the polling average at face value, I'd also be making an assumption. Namely that the undecided voters will vote exactly like the decided and leaning! That's one hell of an assumption. So if you want to come after me for "rigging the numbers", remember that polls do it too, they just do it more subtly. At the end of the day, realize that with over 20% of undecided, there is a lot of uncertainty and my simulations represent this. So maybe focus on the probabilities for now and less of the total seat numbers. These projections use the past election results (transposed onto the new map), current polling numbers, incumbency effect (as well as the effect of losing a long term incumbent who retired). I intend to use as much information as possible, including social network data and others. But for now, the projections are relatively "bare bone" and mostly rely on the polls. I also took care of the couple of independent candidates who decided not to run again (for instance in Delta South). I use thousands of simulations (currently 10,000 to be exact) in order to get the probabilities. I account for the uncertainty of the polls (margins of error) as well as the distribution of the vote (i.e: vote efficiency). These probabilities have proven to be quite accurate even when polls weren't. Also, the model has yet to make a mistake when calling a candidate at 100% or 0% chances. Thanks the the Green being polled so high, there is a non-negligible chance of a minority government (14%). This is highly unusual for British Columbia in the modern era. The rise of the Green party should be the topic of the beginning of this campaign. The party has a new leader (compared to 2013) with Andrew Weaver (who got elected 4 years ago). From what I can see, they seem very organized this election and are aiming for way more than 1 or 2 seats. The polling numbers are especially good on the Island according to Mainstreet Research (the Green are actually first there!) but Insight West shows the NDP still ruling this region. The potential issue for the Green is that their vote is softer (i.e: less committed) and it's possible many voters who only want to get rid of the Liberals will ultimately vote NDP. Speaking of which, according to Insight West, 53% would be very upset if the BC Liberals remained in power. Also, 64% think it's time for a change of government. These numbers don't look very good for the BC Liberals but it remains to be seen if the opposition to Christy Clark can gather around one alternative or the vote will be split between NDP and Green. It could especially be the case as the Green party is targeting seats on the Island, seats that would otherwise go to the BC NDP. In terms of issues, it could well be housing vs the economy. The former is seen as the most pressing issue and voters seem to trust John Horgan more (despite recent policies from the current government such as a tax on foreign home buyers) while they definitely trust Christy Clark more on the economy and job creation. British Columbia has enjoyed fast growth in recent years and its public finances are healthy. Christy Clark is usually not well liked (and a majority of people believe the Liberals to be corrupt), but governments tend to be reelected when the economy is doing well. That is all for now. Let's the election begin! It should be a lot of fun, at least for political nerds!